Nokia has launched three new handsets in India: Nokia 7230, Nokia E52 and Nokia 6700 slide. All the three phones were announced last year and were highly anticipated, especially Nokia E52. Nokia E52 was announced in May 2009 and Nokia 7230 and Nokia 67oo slide in November 2009. The Nokia E52 is a successor to E 51, which was very popular in India. While the E52 was launched in other countries much before, it made its appearance very late in the Indian market and consequently many Indian consumers purchased the phone from outside. Nokia E52 is a Symbian device and will be priced at Rs. 12500 INR. Coming onto Nokia 7230 and 6700 slide, both have slide-up design. The most compelling feature that could pull many consumers towards these 2 new phones is that both have 3G capability. The 2 new phones have decent specs even if we compare the camera included with them. Nokia 7230 has a 3.2 MP camera while 6700 slide has 5 MP camera. 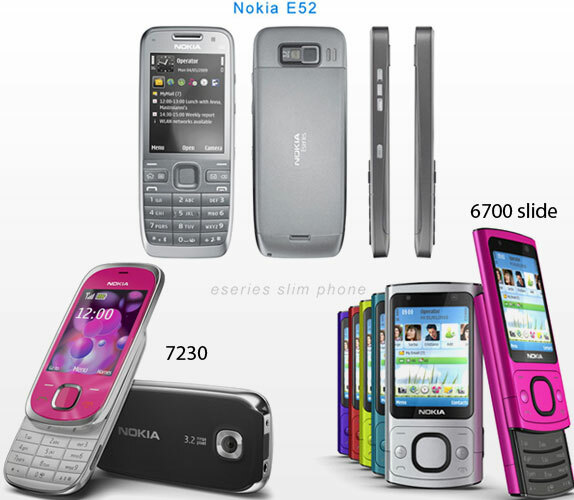 Apart from these, Nokia 7230 runs on Symbian S40 platform while Nokia 6700 slide runs on Symbian S60 platform. Nokia 6700 slide will have a price tag of Rs. 9500 INR and Nokia 7230 will be available for Rs. 6000 INR.